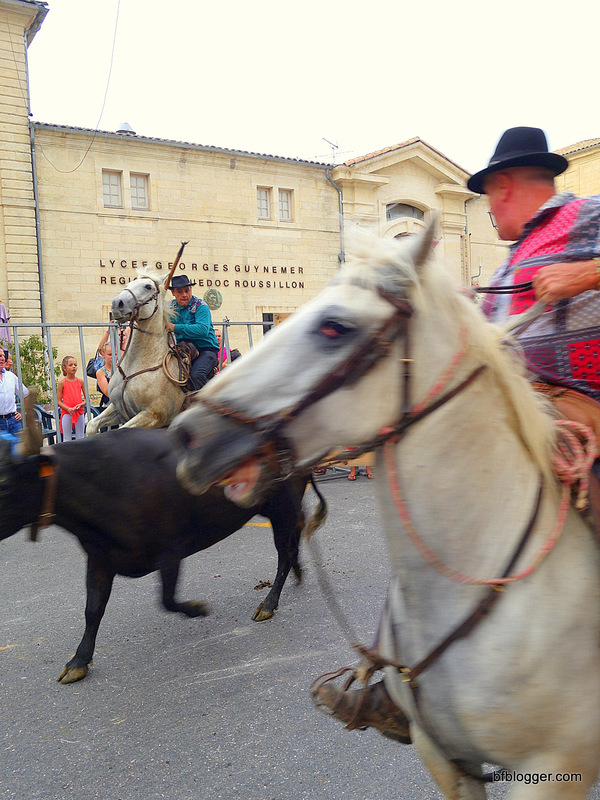 Fete Votive Uzes 2015 was spectacular. How will this year’s event compare? 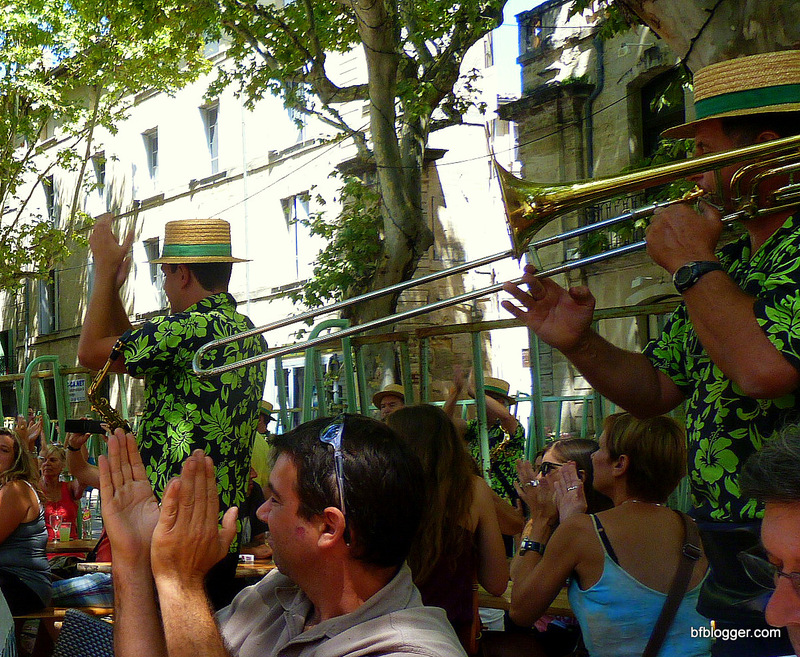 By far, one of the most exciting events of the year in Uzes, in my opinion, is Fete Votive. 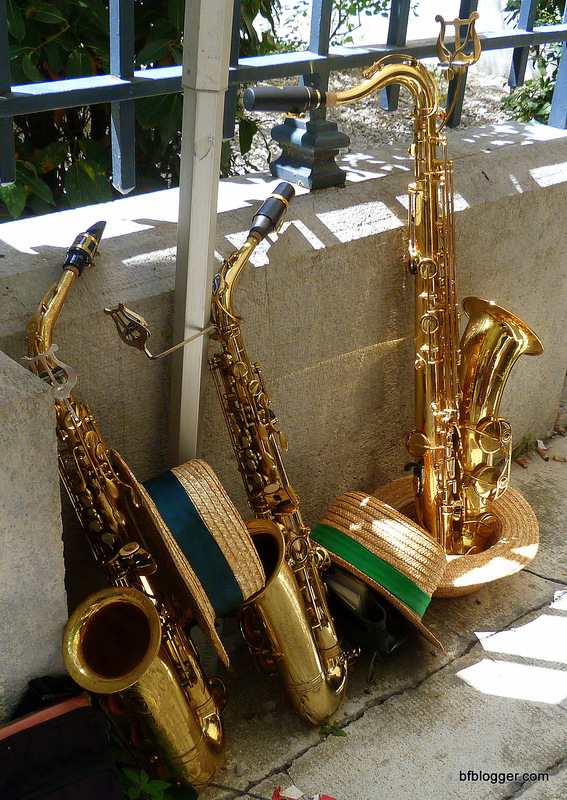 Next week it’s live along the main street in Uzes with lights, action and extraordinary booming sounds. The imaginative “électros soirée” on August 5, 2016 will be the third I’ve experienced. Oh what a night that will be! Below are photos and a video from 2015 and there’s a link to highlights from Fete Votive 2014 for you to preview. When I post the Fete Votive 2016 extravaganza, let me know which you think is the best of the best from the three years. 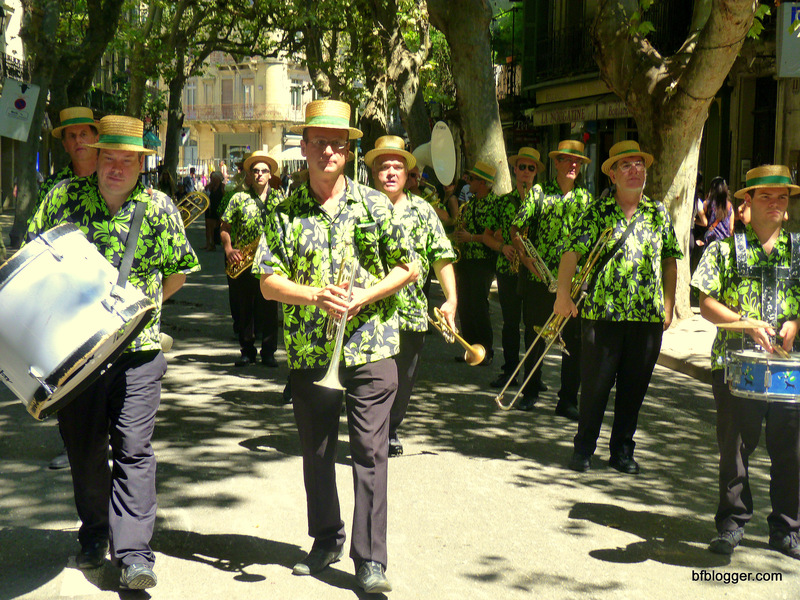 See Fete Votive Parade 2014 revisited here. 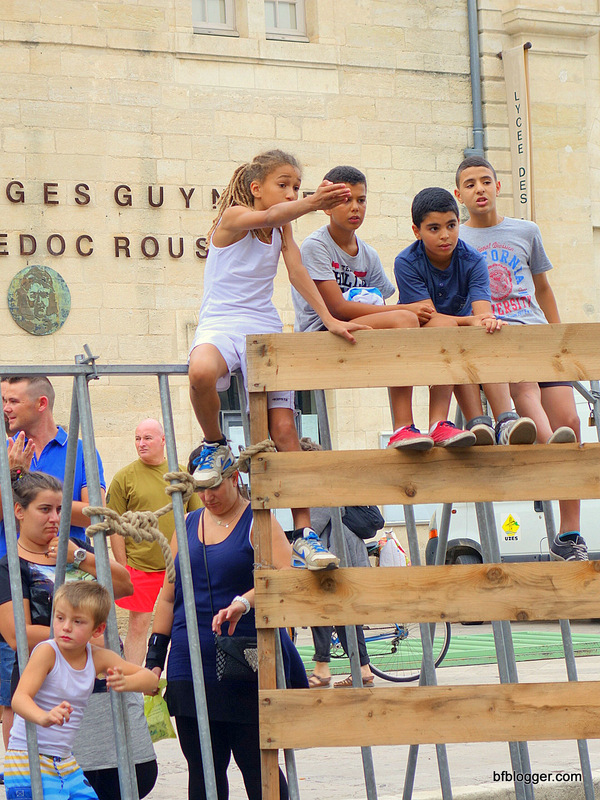 Fete Votive 2015 Uzes: Explosive! 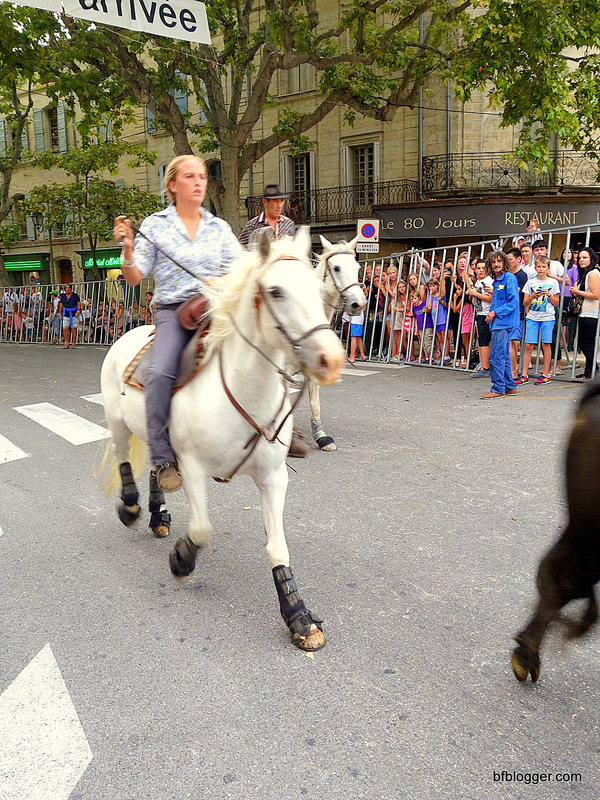 There are few words better than “explosive” to describe the late night parade in Uzes that accompanied Fete Votive 2015. After waiting for hours to see what event organizers had in store for this year’s Fete Votive parade, the crowds went wild. Justly so. 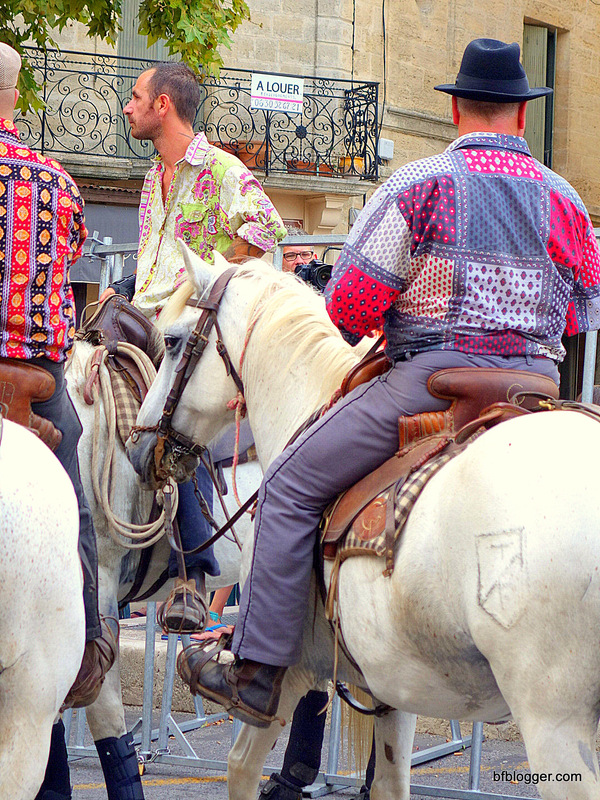 The contrast of the loud, bright, huge moving floats against the pale, regal, ancient buildings along the streets of Uzes was striking. And exhilarating! Did they outdo themselves this year? All I can say is, “I can’t wait until same time, same place 2016! 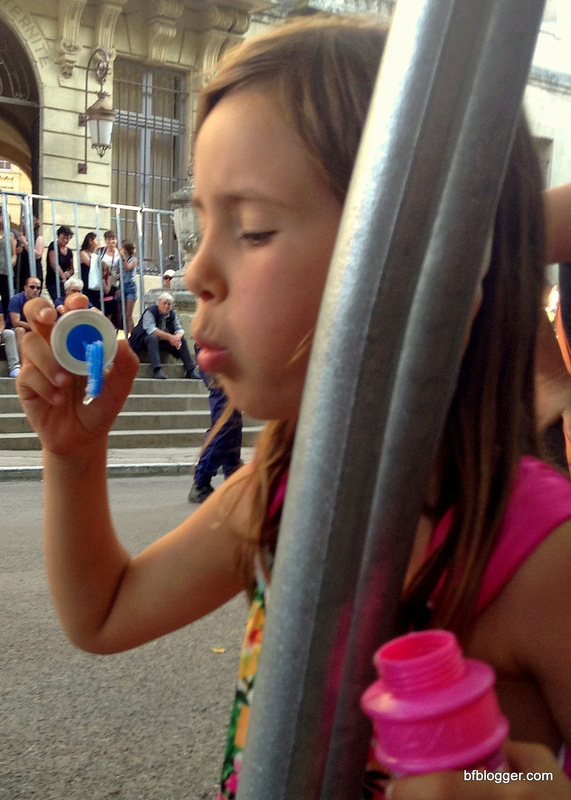 See Fete Votive Parade 2014 revisited. 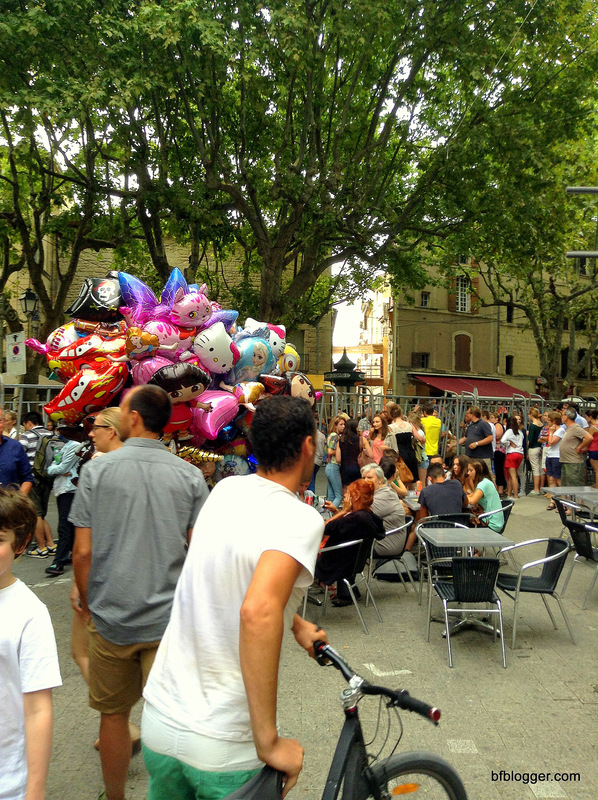 In Arles there seems to always be a party going. 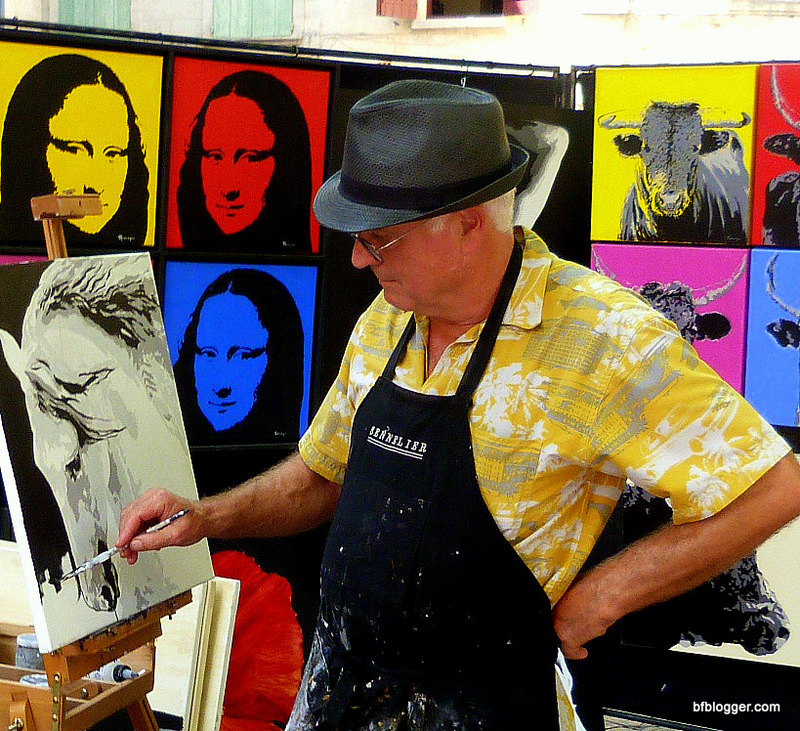 Arles’ Feria du Riz is one of the best. 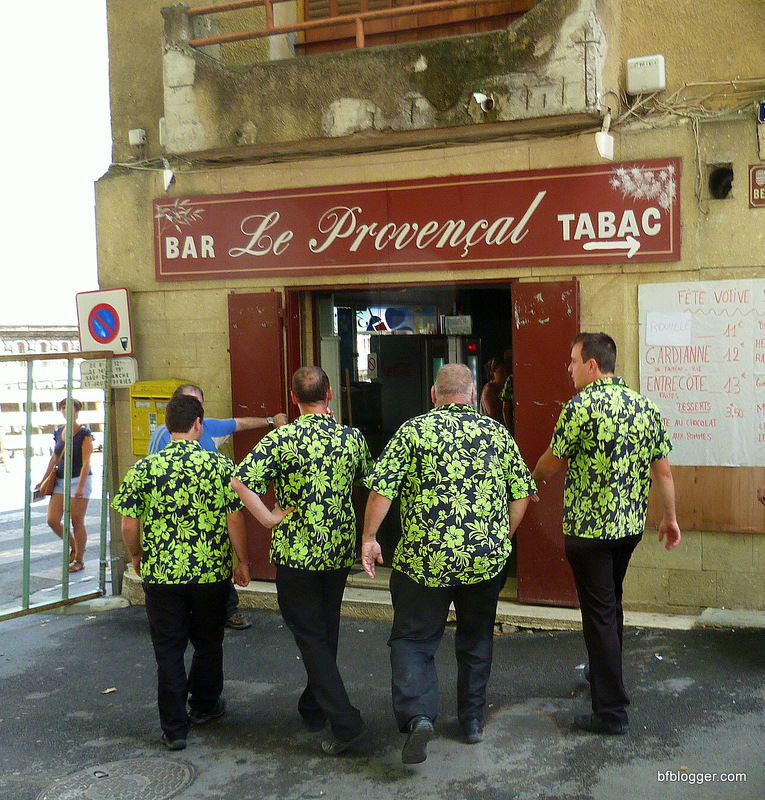 Arles, a town less than an hour down the road that’s mostly famous for being one of Van Gogh’s “hangouts”. The Feria du Riz, the annual Rice Harvest Festival, celebrates one of the region’s top crops — rice. 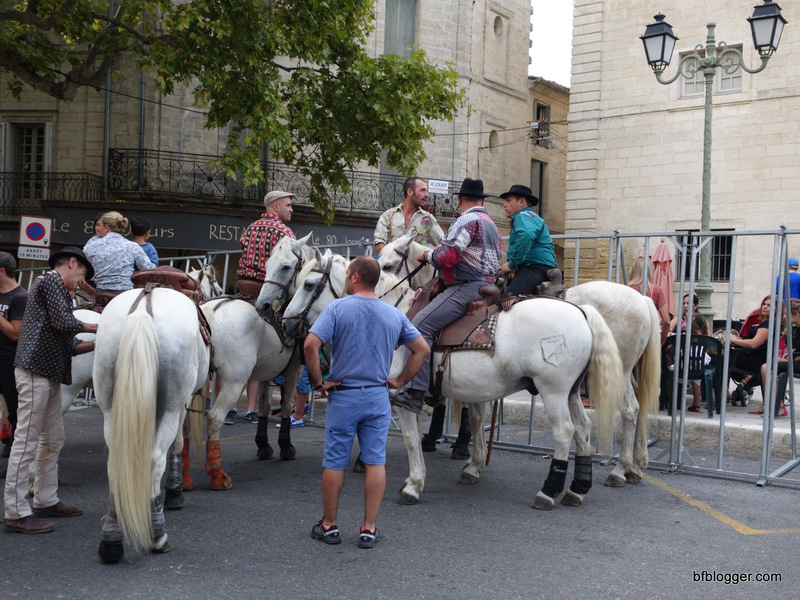 Arles is on the northern edge of the Camargue which has been the subject of a few earlier blogs. Just as bulls, white horses and flamingos are indigenous to the area, rice has been produced in the Camargue since the Middle Ages. Today there are some 200 rice producers in this small area, representing about 5% of rice production in Europe. Camargue’s “red rice” is a popular local souvenir. 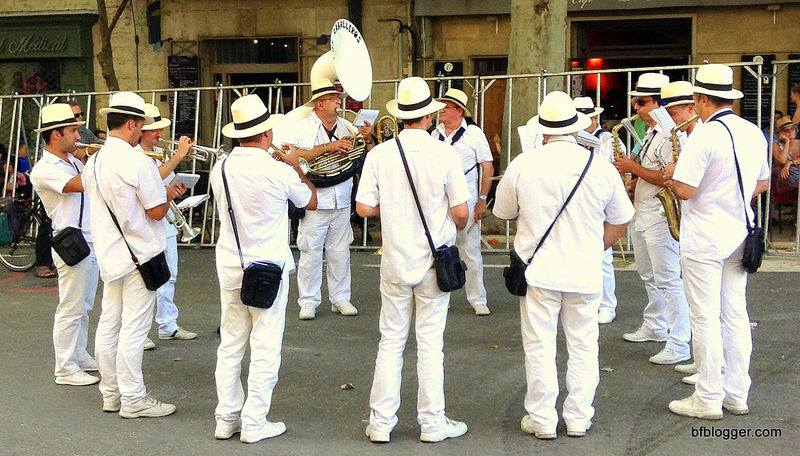 The Feria du Riz is, interestingly, a very Spanish celebration to be in France. The food and the fashions are straight from Spain. 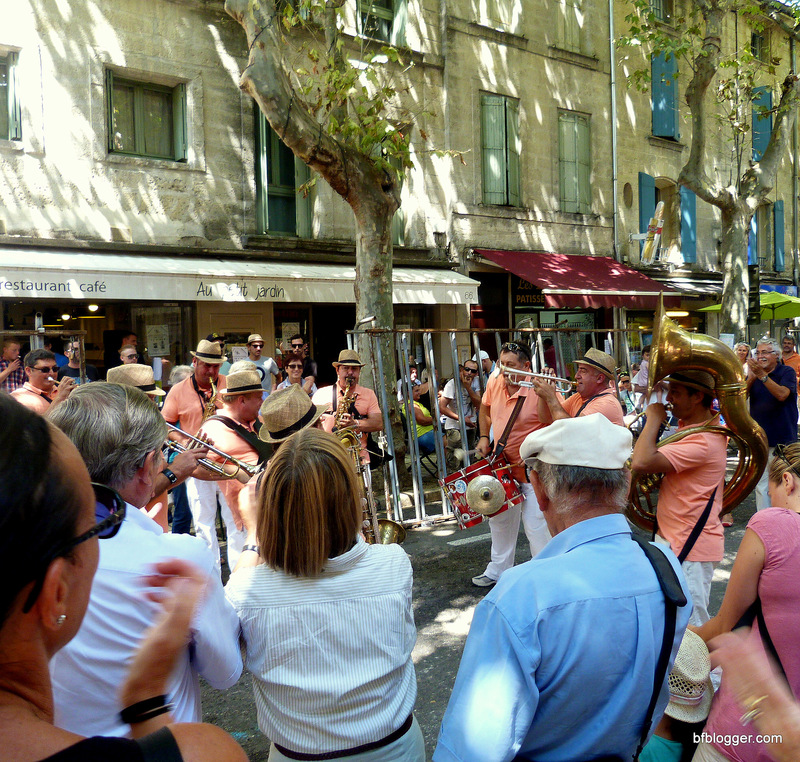 When you drive into the old city of Arles, there’s a long avenue with cafes and shops that leads to a lovely park with a walkway that leads to the ancient areas of the town — the arena and the amphitheater. For the Feria, the avenue is spread with carnival-like booths with food vendors and souvenirs. 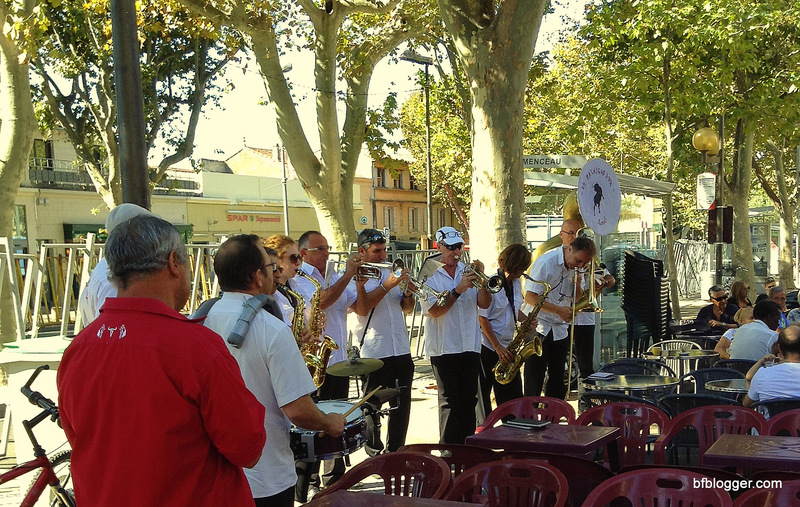 At cafes along the way, the ohm-pah-pah bands are warming up the crowd for the afternoon festivities. 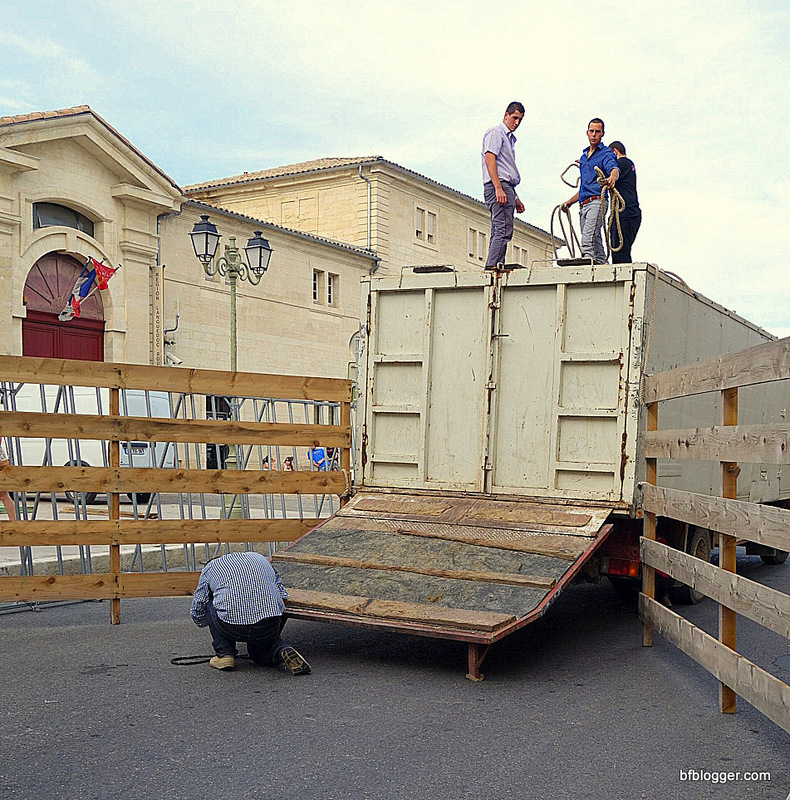 Road barriers lined the street for the running of the bulls scheduled for the early afternoon. Since this is a Rice Harvest Festival the food booths along the way were showing off their take on — a Spanish favorite that matches with the theme of the Feria. 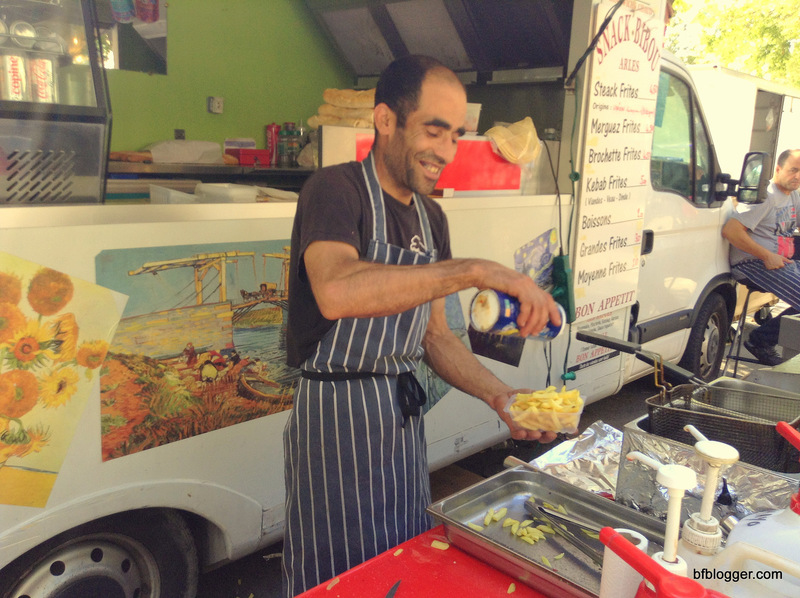 I was starving when I hit town and this was the first paella stand in line, so it was my pick. 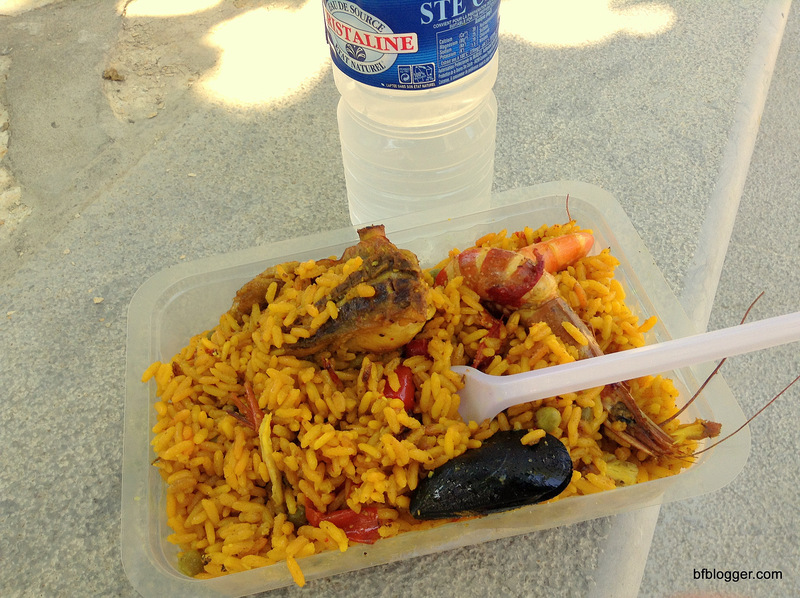 I sat on the steps of a fancy hotel and restaurant and gulped down the serving of paella with a bottle of water. It hit the spot on the already hot day. As I walked down the street, I wasn’t certain the place I stopped was the best choice. It all looked so good! 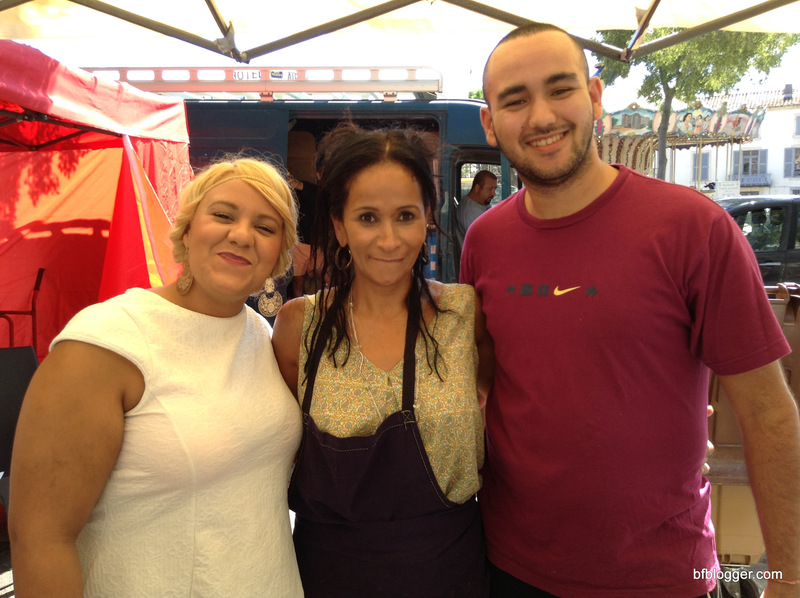 These photo-perfect folks were putting out some fabulous kebab dishes. One popular food offering was kebabs — in all varieties. There were kebabs in sandwiches and kebab “stew” served over frites (french fries). The kebab mixtures were steaming away in huge pans, just as the paella. Then there were the fish specialties — a Fisherman’s plate with calamari and pots of steaming moule (mussels). My favorite stop of the day was a sidewalk shop with the Spanish dresses, skirts and all the frills. I had to hold myself back from buying one of the skirts. Imagine a holiday party wearing one of these! Beyond the vendors I walked to the entrance to the park and walkway to the old town. When up the steps and around the town building, there lay before me the beautiful village of Arles, with buildings and roadways centuries ago. 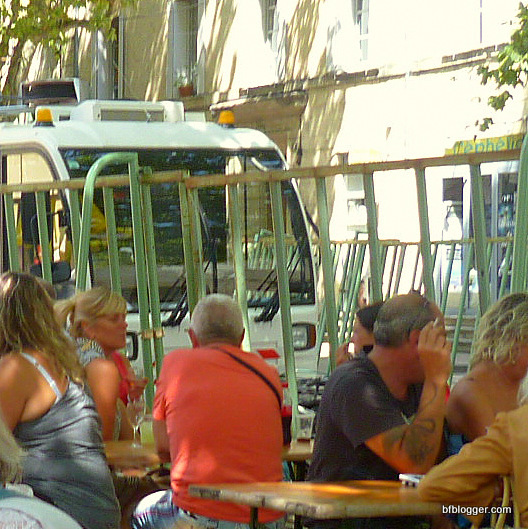 People were everywhere, in every square, eating and enjoying festivities and socializing the warm September Sunday. 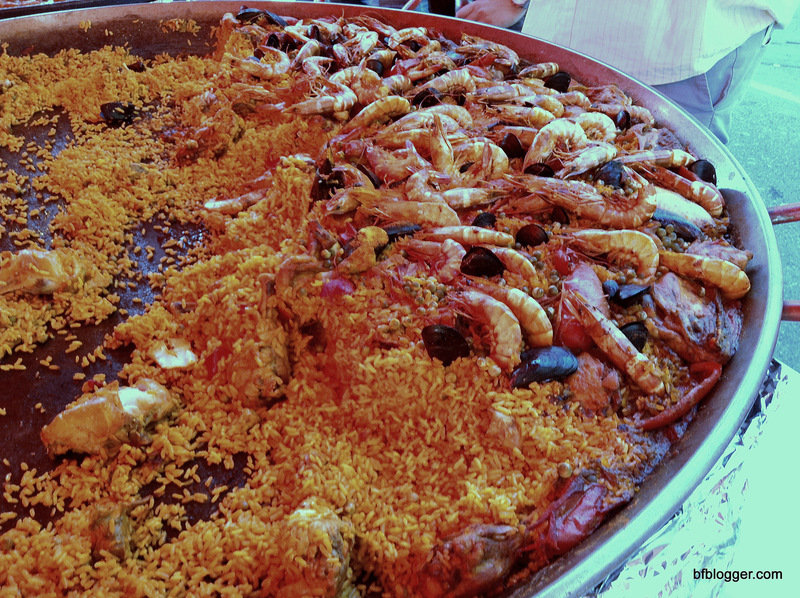 One of the famous squares in the city, during the Feria, is a showcase of artisans and regional foods. 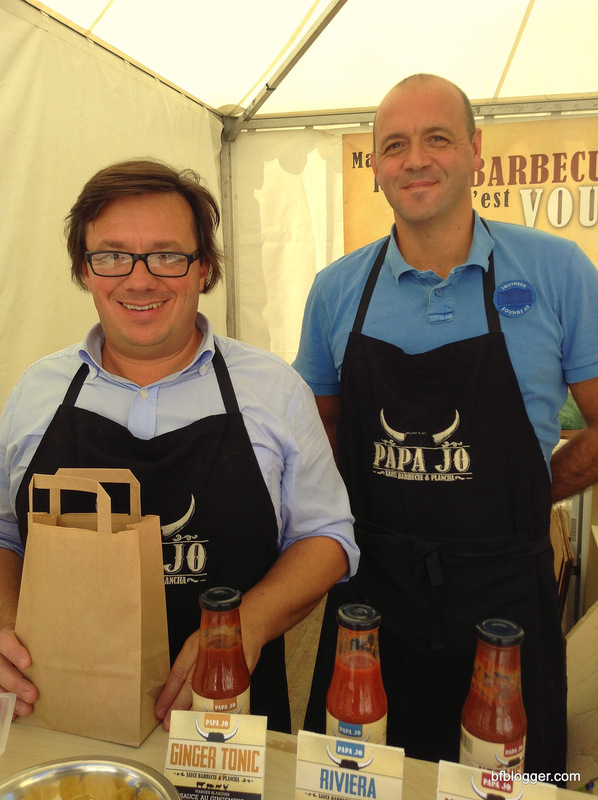 To my surprise, one of the new products being displayed was barbeque sauces. 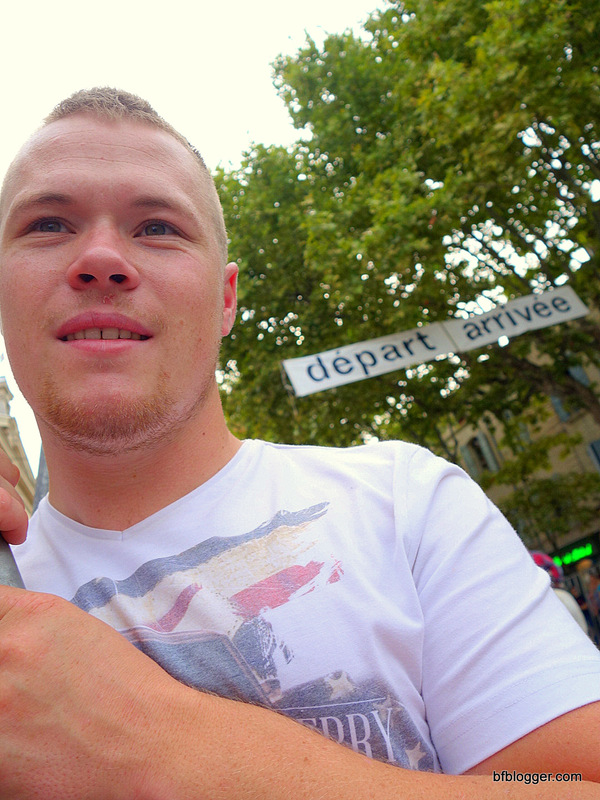 In France? I could hardly believe my eyes. Of course, I had to strike up a conversation with the owners to tell him I’d been to Memphis in May — the barbeque event of the year. He knew it well and hopes to make it there someday himself. 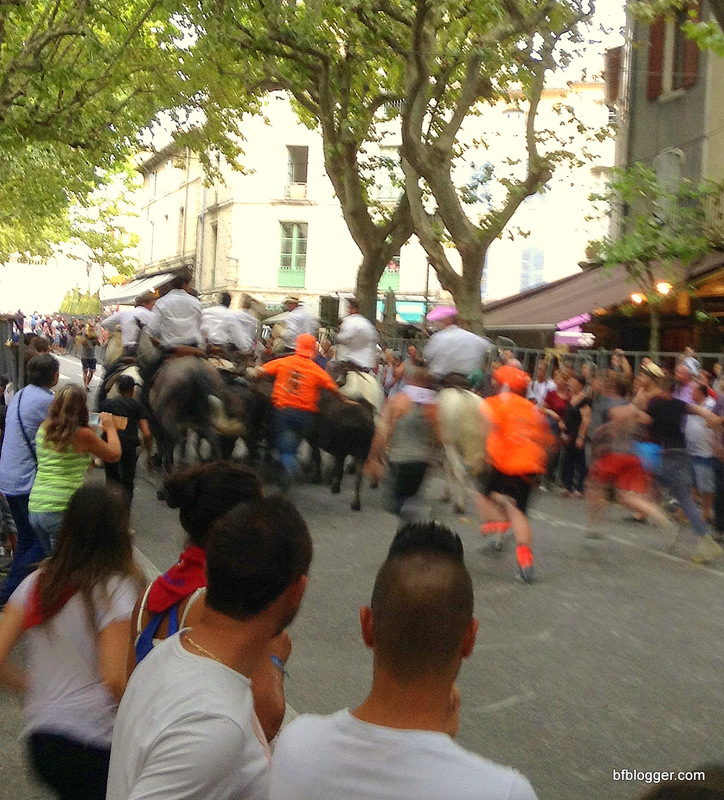 After spending most of the afternoon walking around the town and checking out the food stands, it was time for the bulls running in the street. This time I knew how to get up close and personal. For the next post, though. 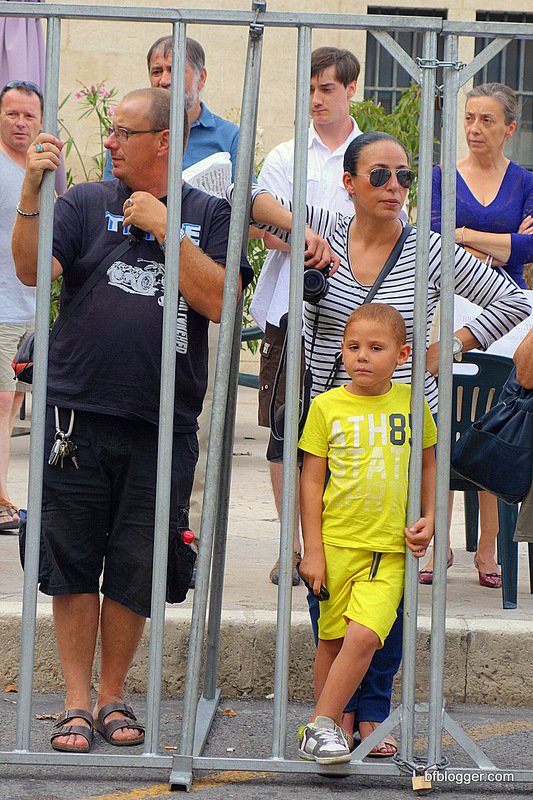 Along with all the fanfare that surrounds a bullfight in the south of France. Stay tuned! 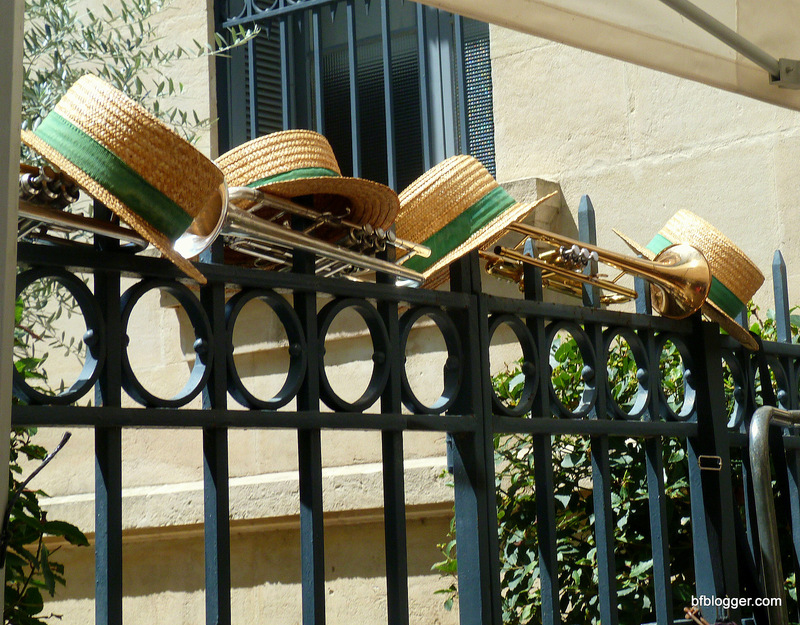 The Fete Votive in Uzes 2014 has come to a successful end. Although the weather could have been better for some of the events, the spirit of the crowd was hardly dampened. 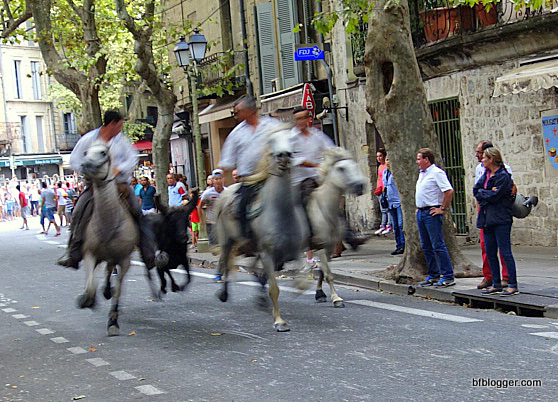 Final days and nights of the annual festival were filled with the more bulls, horses, men and young boys and girls running through the streets. While the opportunity for disaster was always possible with the huge animals galloping down the crowded road, it was amazing how there were no injuries to man or beast. 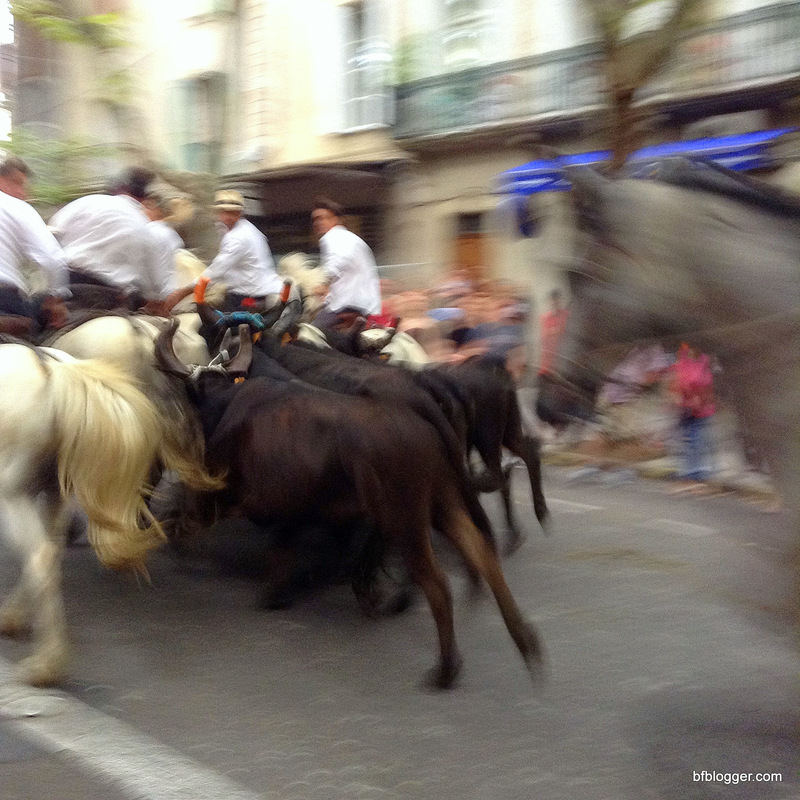 It makes me wonder about the running of the bulls in Pamplona. Is it tamer than we think? If so, would it draw the crowds? Saying I was in the middle of the road waiting for the bulls to rush at me, it’s not a joke. 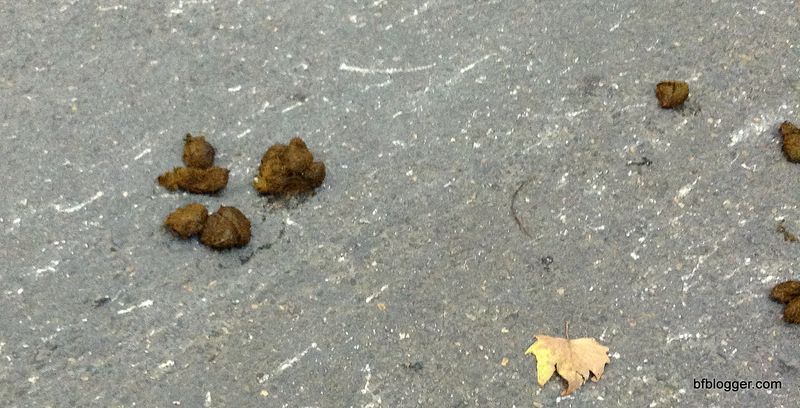 Guess it was fool’s luck that there wasn’t a wayward bull that pulled away from the herd. 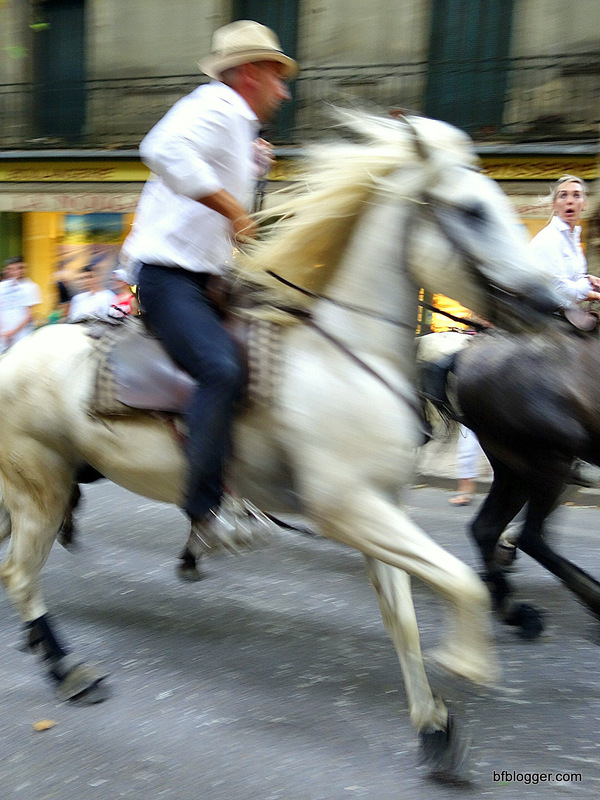 Has this given me the courage for Pamplona next year? 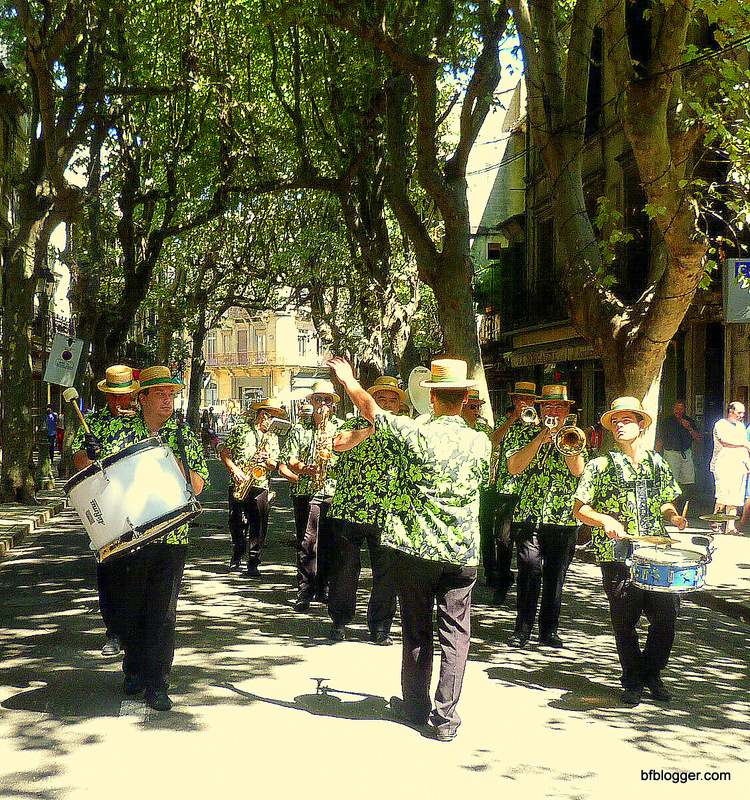 During the Fete Votive there are activities that all the town’s people and visitors enjoy. 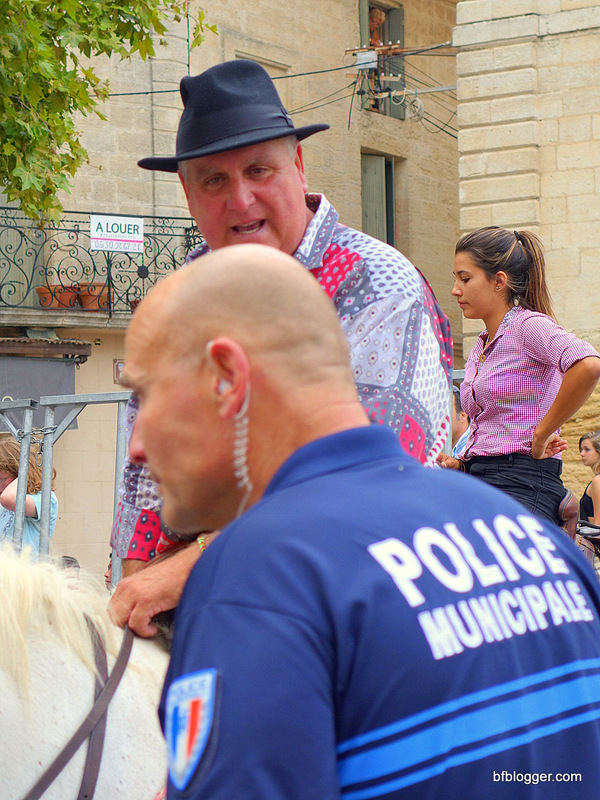 That said, my favorite events were the crowd scenes — the running of the bulls, the parades, and the brass bands that appeared almost everywhere you’d go around the village. 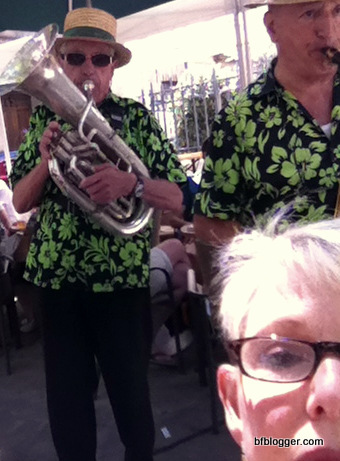 Brass Bands on the sidewalks. 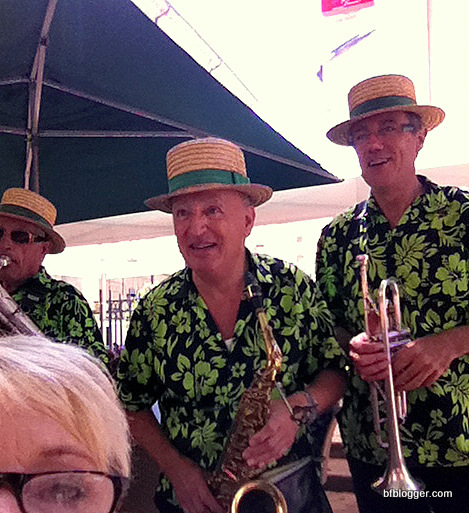 Brass bands playing in your ear. Brass bands heading for the watering hole. … and the best part? It comes again next year! Oh my! Now I know. 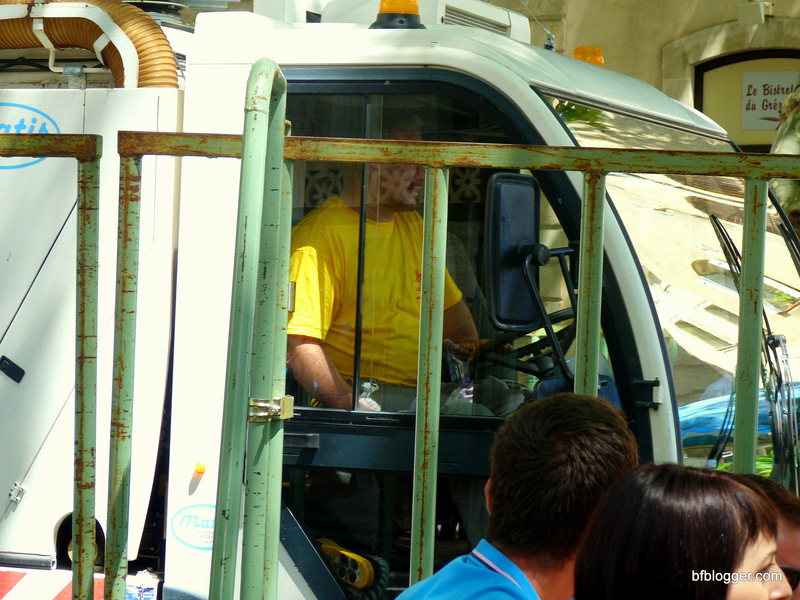 Every August the streets of Uzes turn from business into a carnival. 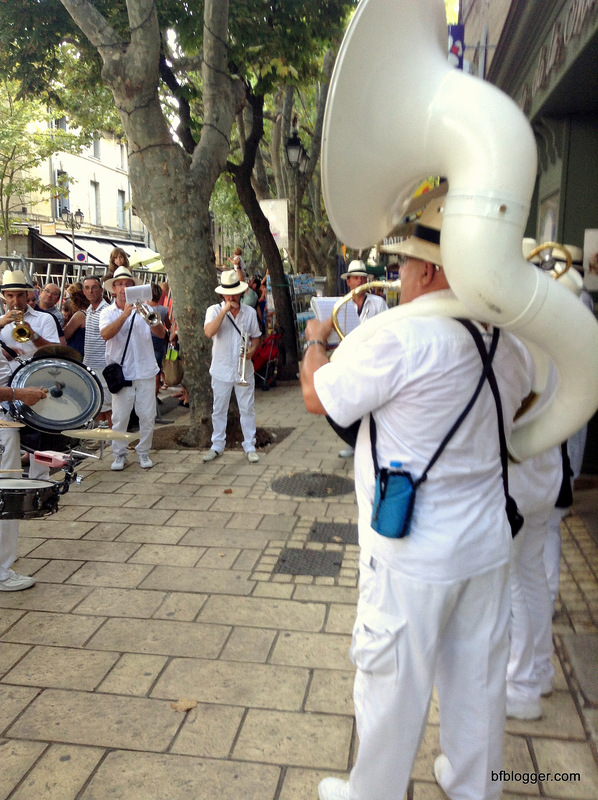 Bulls run in the streets; brass bands with men and women in colorful uniforms “oomp-pa-pa” through the village; and parades with spectacular floats fill the place with music and lights. 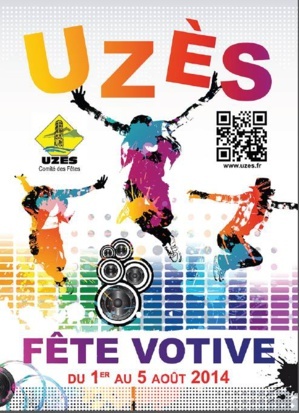 The Uzes Fete Votive schedule goes on for six days. 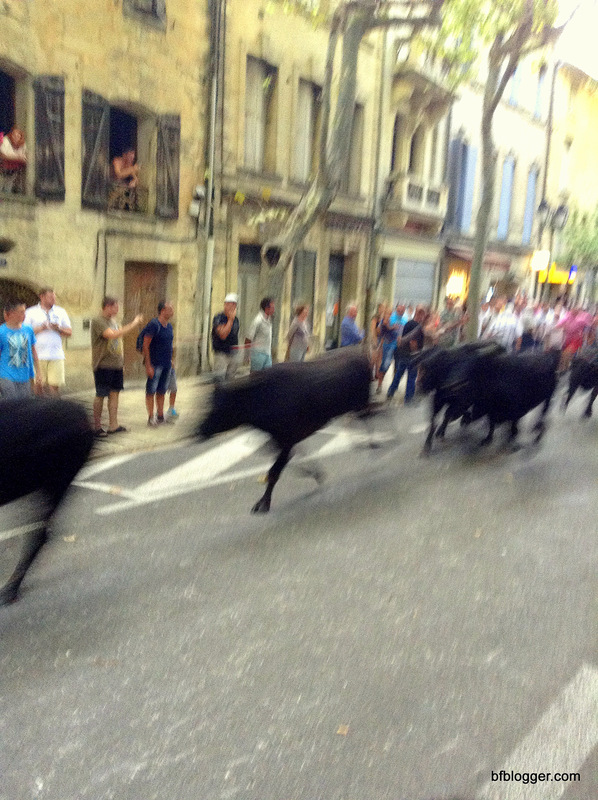 This is the running of the Bulls — Day One. 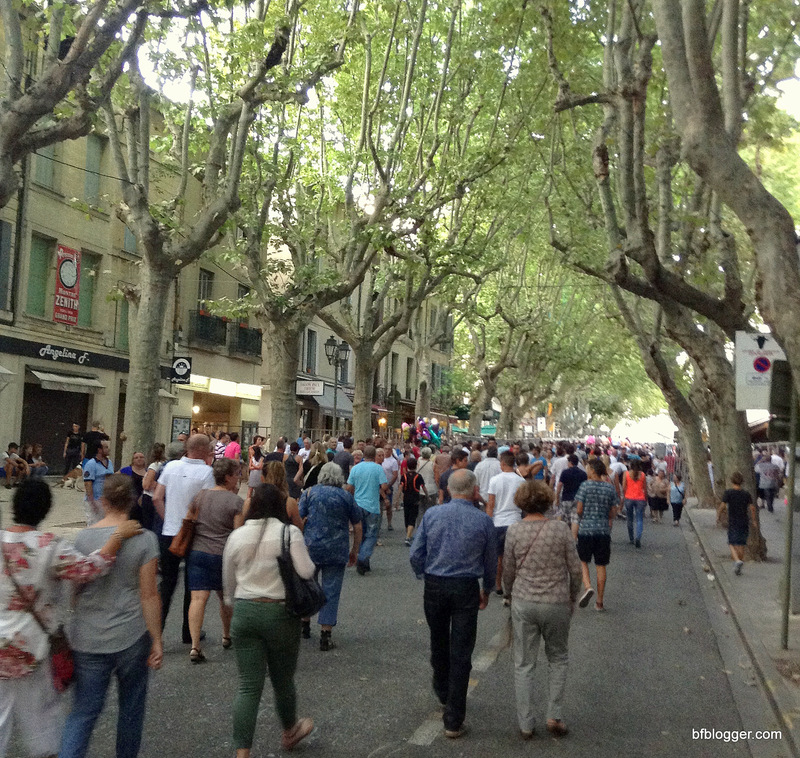 People line the “main” street of Uzes waiting for the entertainment to start. 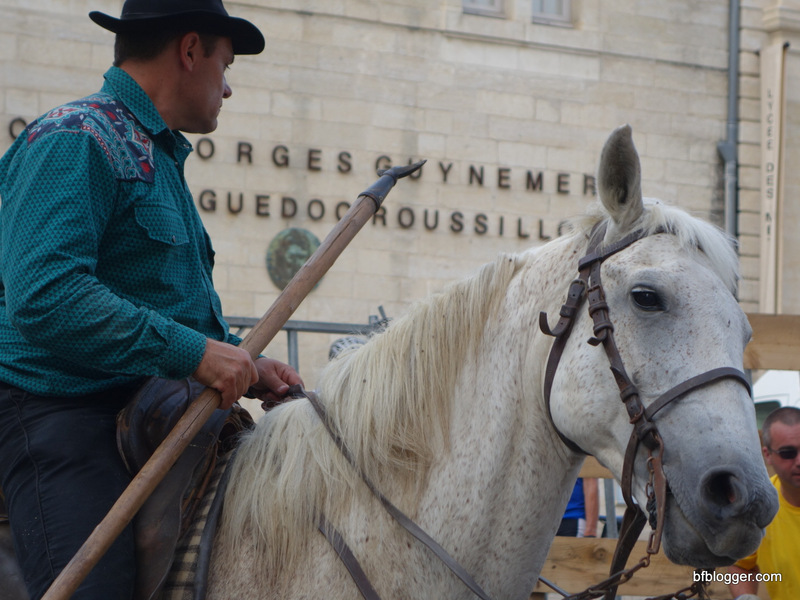 Horses and cowboys from the Camargue ready themselves for the action. They know there’s an important, dangerous job ahead. Horses are restless. Even so, this one made a special effort to pose for the camera. 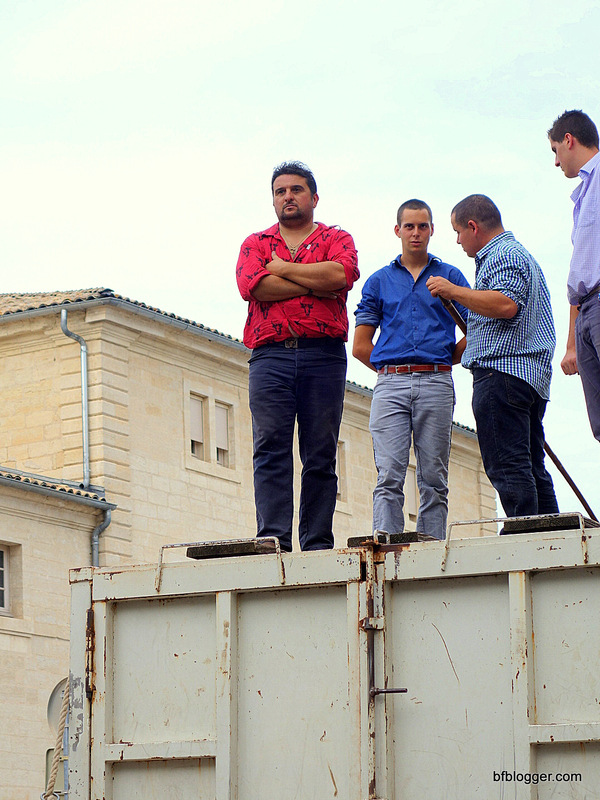 Handlers were listening for the signal to let out their cargo of Camargue bulls. Your guess what this was about? Then, in a flash, the truck gate was down and the bulls dashed out in a fury … faster than the eye … and faster than my camera. 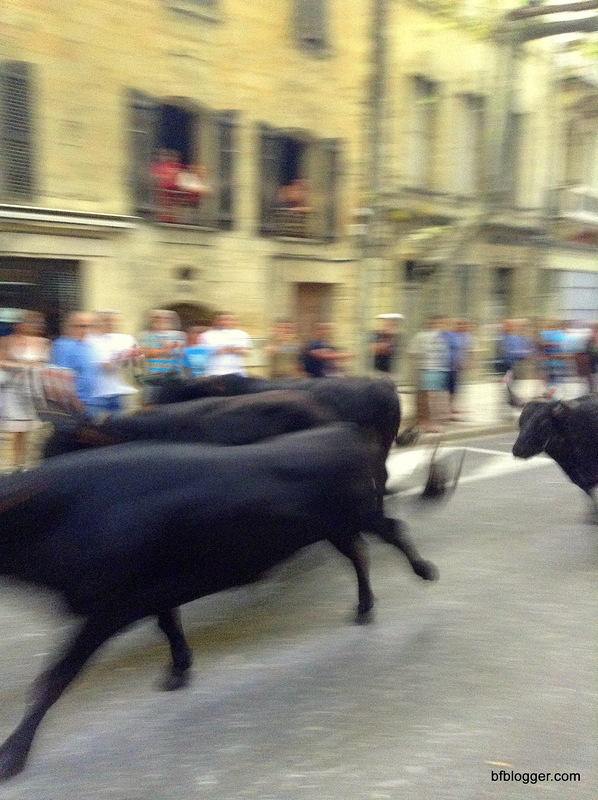 The bulls were released in such a hurry … three of them at once … that I thought I had missed it all. You do see the bull? Right? In just a few minutes a buzz from the excited crowd signaled the bulls were on the way back! Oops! Too fast. Missed again. Note: Bull on the bottom right .. or leg of bull. Thinking I had totally missed getting a shot of the bulls, I glanced around and saw that the young people standing near me — Arnaud and his friends from Normandy — had captured the action on video. They were more than happy to share it for the blog. Yes, it was over that fast… 2+ seconds! 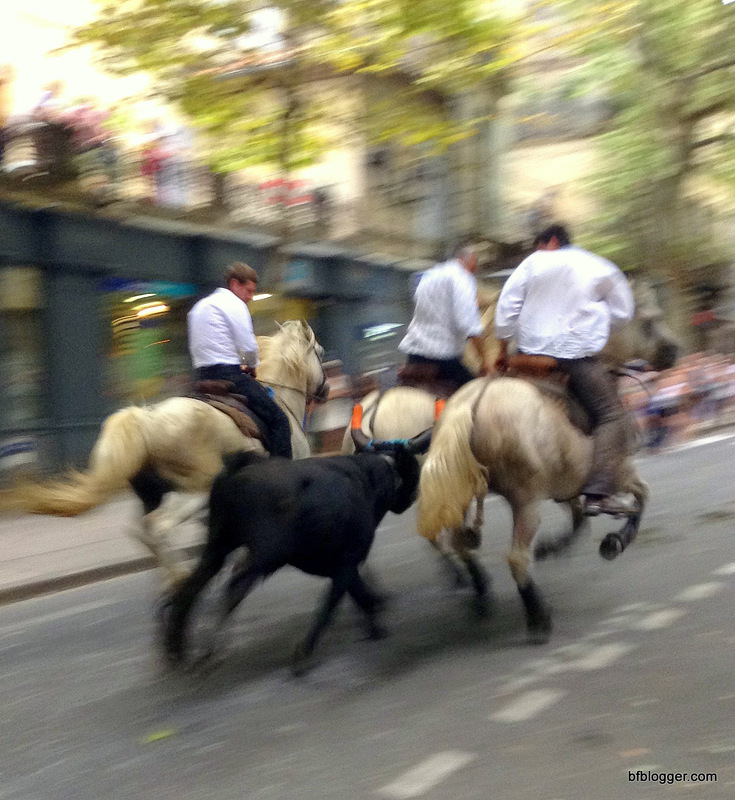 What I didn’t know was that chasing the bulls up and down the boulevard goes on for an hour. Up and down, down and up. And if you walk down the street, there are better places to view the spectacle. After an hour of bulls and horses running up and down the street, I was able to catch a few decent shots. 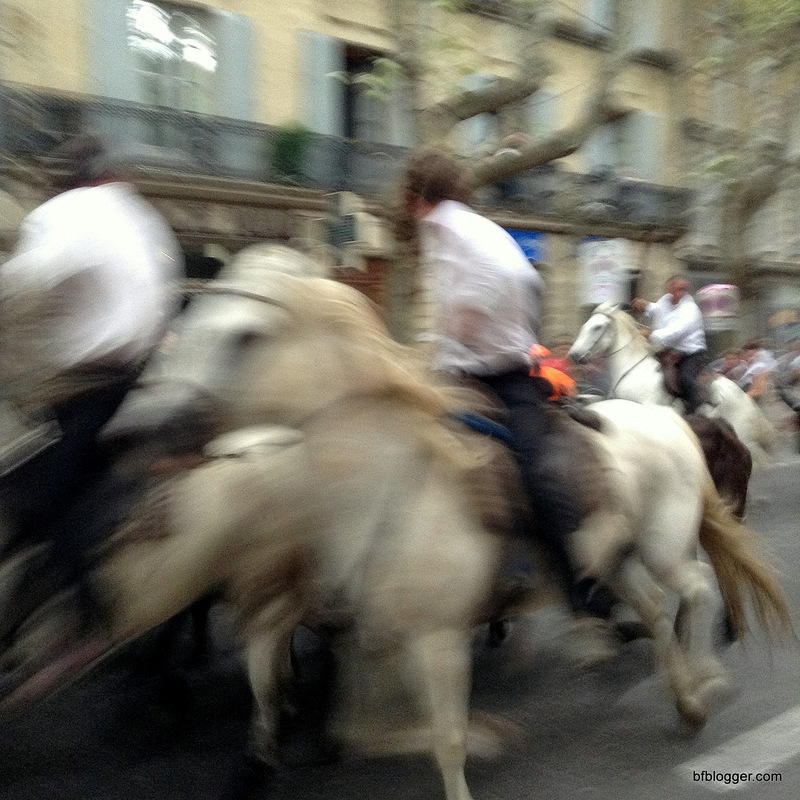 Mind you, they come storming down from the boulevard in a mass of horses with riders, bulls, and people chasing the bulls. Then they’re gone. Yes, they were that close! 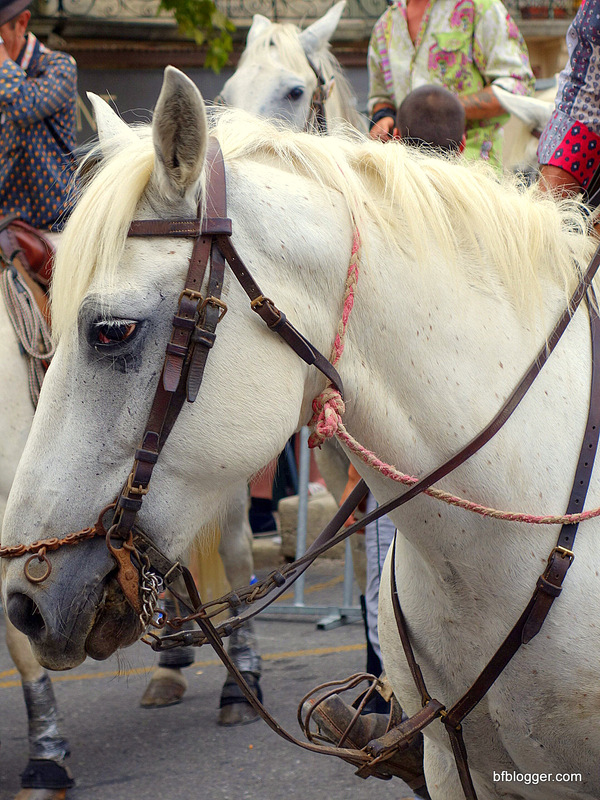 If you wonder what it feels like to be standing in the middle of a street with horses and bulls headed your way, check out the video. 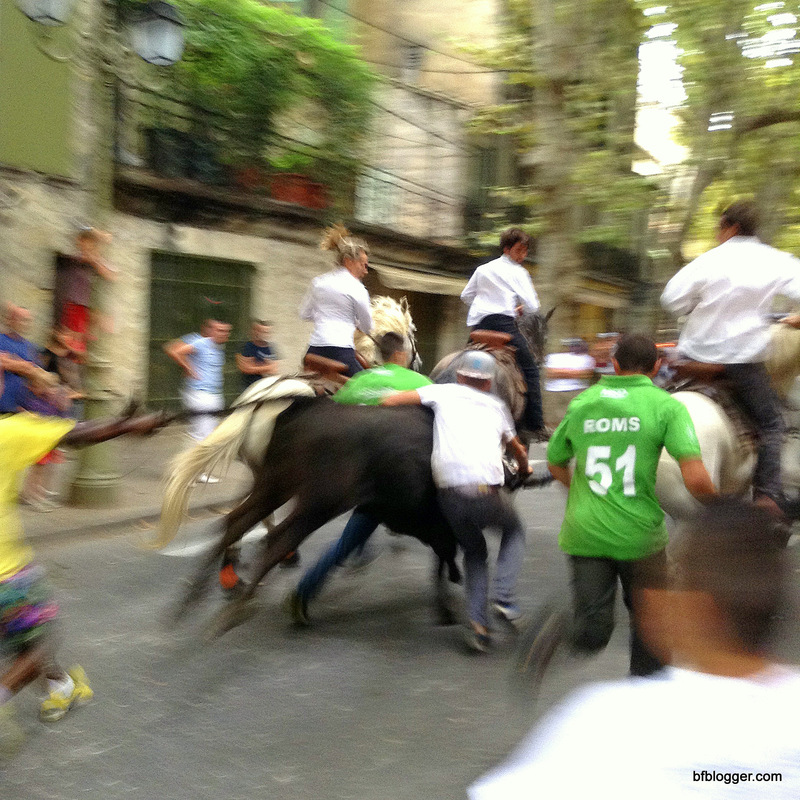 Running of the bulls in Uzes today . Pamplona next! Check out GingerandNutmeg.com for more photos and interesting factoids about similar celebrations nearby.